Today I was tagged in a Twitter meme entitled "7 Things You Don't Really Need to Know About Me". I have been on the Web for so long, and never have hesitated to share, but here are some things that you might have missed! 1. I had perfect attendance in high school. 2. I was my high school mascot. 4. I have ridden motorcycles since I was 7 years old. 5. I maintain the Unofficial American Graffiti home page. 6. I maintain the Dave DeBusschere Sports Card site. 7. We live in a geodesic dome and our son's middle name is Buckminster. When the App Store opened for the iPod Touch and the iPhone, I first found myself drawn to the applications that took advantage of the great graphics, the well-crafted touchscreen, and the built-in accelerometer which enhances the use of some very cool apps! However, as time progressed, I began to look at applications that would increase my productivity and also have a desktop component. I like a desktop component for both the ease of lots of data entry and for peace of mind, since the data is backed up on both the handheld and desktop devices. One piece of software that I received as a demo, SplashShopper, created by SplashData, I have found easy-to-use and very useful! SplashShopper is just what it sounds like-- it is a shopping list application, and comes with pre-populated shopping lists for all types of things, including books, gifts, groceries, movies, etc. However, it is very easy to re-create these lists to meet your specific needs and even create your own list. The lists, especially the grocery list, can get very detailed. However, I did not care about some of the fields, so I just entered the item, the broad category, and the aisle fields when entering my grocery store's items. I used the desktop component for entering all 174 items. Many years ago I had a stand-alone photo scanner, back in the days when flatbed scanners were really expensive. It worked (most of the time)! I find archiving old photos on a flatbed to be very time-consuming. Just recently, I ran across the Pandigital Photolink One-Touch Scanner. As you can see from the photo comparison, the scanner is very small- it is 6"x 2" x 1.5". It only can scan up to a 4" wide image, but it is perfect for the 4"x"6 photo size. Here's how it works. It comes with an SD card, but has a 5-in-1 card reader (Compact Flash-Type 1, MemoryStick, MS Pro, MS Pro Duo and DUO (with adapters), MMC, SD and all the little SD versions with an adapter, and xD (H-type and M-type) on the back side. You just plug in the AC adapter, and scan your images through the scanner, one at a time, and they are saved on the card in an 1800x1200 resolution at 300dpi. It is speedy to scan multiple photos, and, although this is not a high resolution, the colors are true, and those old photos from the pre-digital camera age of the 60's, 70's and 80's look just great! You can hook the scanner up to a desktop and it acts as a card reader, too, and you can easily move the photos off the memory card and onto the desktop for burning to your archival CD, posting to flickr or Facebook, or making your PhotoStory. Created in the style of the Common Craft videos (with permission) here is a well-done video about the networked student, Web 2.0 tools, and the networked teacher. Thanks to Wendy Drexler and her son for creating this! Well, after living with the Apple iPhone for four months today, I have to say that I still love it! I can do most of what I need to do on a daily basis and the interface cannot be beat! It was not until the App Store launched, and I installed the OS upgrade on my iPod touch to try the App Store, that I realized the power of having a well-engineered, converged device. I have been a smartphone user for years (both Palm and Windows Mobile) and there is truly no comparison. I have been following the other new devices, like the Android and Storm, and do not feel a bit of techno-lust! The only downside is the poor battery life. I know I can shut off some functionality to prolong the battery life, but that is an inconvenience. (However, I guess it is MORE of an inconvenience to have no battery life left!) I have just purchased a small battery life extender (Kensington Mini Battery Extender) and that should solve my problem. If you have an iPhone or iPod Touch and want to share your favorite apps and a short description, please do! I have purchased Tweetie for using Twitter on the iPhone. It is a full-featured Twitter client that is very easy to use and parses well on the device. The Kensington Mini Battery Extender arrived it and works very well! First it charges up the device, and then, when you use the iPhone, it supplies the power until it runs out of power and then you start using the iPhone battery again. Here is a list of 50 iPhone apps for education that came out right after this post. I have long bristled at being called a "digital immigrant". I know the difference between the understood explanation of the "digital natives" and "digital immigrants" as outlined by Marc Prensky. I did not grow up with technology. It grew up with me, and I was there every step of the way. I think those of us who have been there since the beginning, and have adopted each technology as it came about, should not be called digital immigrants. I do not turn to the printed manual first. I always choose reputable Internet sites to locate information. And I do speak the correct language (and still do not accept Google as a verb!) There are very few technology skills that are foreign to me. I want to be in a third category of technology users called "digital pioneers". This group of users grew up as technology grew up. This group of users has mastered both the skills (learned from years of technology risk-taking and experimentation) and the processes (learned from the real world and the online world) of information literacy and choosing the correct tool for the task. These users are the technology mentors and evangelists in the education field and are very passionate about the topic. They are constantly looking for new and old technologies that will support teaching and learning in a meaningful way and they always share their findings with others. There will only ever be a finite group of technology pioneers since, by the definition of growing up as technology grew up, the digital pioneers would have to be 50 years old or older at this point. Many so-called digital immigrants, teachers who came later to the technology arena, are doing a wonderful job infusing technology meaningfully into teaching and learning. These tech-savvy educators are teaching to the current generation of so-called digital natives in ways that support these students' varied learning styles. But please call me a "digital pioneer". I used one of the cool options on Dumpr for my Facebook icon and lots of people have asked about it. I discovered it a while ago and have been meaning to share. Dumpr is an easy-to-use site for creating fun photos! It would be a great site for students to use for their "about me" slide in a presentation. No registration is required to use the site to upload an image and download the project. I have always disliked the fax machine. It seems like old technology that is past its prime at this point. However, since my husband and I both need to send and receive faxes, it was a necessity to have one in the house and on its own phone line. Over the past few years, the number of junk faxes that have come in, wasting our ink and paper, has become so overwhelming that we keep the machine off unless someone notifies us that they need to send a fax. It kinda defeats the purpose. Back in the old dial-up days, I tried to use the fax option, via the modem, that came with Windows, but that did not work very well. Recently, I decided to see if the Web-based fax services had come of age yet. Well, guess what? They really have! After some research, we went with Faxage. They ported our existing Verizon fax number over to their service so the fax number remained the same. The company communicated with us every step of the way-- they were great! The system allows us to set up fax folders for all of us in the family, we can each have our own fax cover sheet, and we are notified via email when a fax comes in (and the fax is attached to the email for a quick review). If it is a junk fax, it is a simple delete! The faxes are kept in PDF format within their system and are very readable. Of course, when sending out a fax, if something is not already digital, we have to scan it to the computer, but it really is not troublesome. The option we chose was $7.95 per month for 150 faxes. We are saving the $24 for the phone line and $10 for the long distance service per month on the line, AND our ink and paper is not being wasted by junk faxes. I think it is a win-win situation! Netbooks are the new "little" laptops that are all the rage. There are those that have 8.9" screens, 9" screens, and 10" screens. There are those that run Linux and those that run Windows XP Home. There are those that have solid state drives (SSD) which have no moving parts and those that have regular hard drives. There are white, black, pink, green, red, and blue versions of netbooks available. They have wireless, Ethernet ports, multiple USB ports, VGA-out and some have card readers and built-in video cams and mics. I have had two since this class of computer came out. I started with the 7" Linux-based Asus EEE PC which was a swift little machine with a great suite of tools. I then moved to the 7" XP Home version of the EEE PC, but the SSD was not large enough for the apps I wanted to run. I fell in love with the 8.9" EEE PC 901, but, by that time, there were starting to be more of these on the market and at good prices. I toyed with the idea of the MSI Wind (10") for a while since it had a bit larger keyboard than the EEE PC. The price was right, but the overall device was kinda large for my idea of a netbook. I liked the HP Mini-note 2133. It had a great keyboard, but by the time I spec'ed it out to have the OS and hard drive I wanted, it was too pricey. The Dell Inspiron Mini 9 came out today, but it is not available with any more than a 16GB SSD. I have been reading great reviews of the Acer Aspire One, and the only negative I could find was it only had a 3-cell battery. The price was right, the keyboard was largish, the size was right, the camera was 1.3 megapixel, it came with a regular-sized hard drive with XP Home, and had all the best of all the devices. It does not have Bluetooth or an N-standard wireless protocol like some of the others though, but this was not a deal-killer for me. Today it showed up on Amazon with the 6-cell battery and even a larger hard drive than the previous model, in white or a sapphire blue color (if you care about things like that), and at the price of the earlier version...w00t! I ordered the blue initially, but after reports of its "smudginess" and having to type on a black keyboard, I decided on the white one. For those of you who want a little larger netbook with 10" screen, the Asus EEE PC 1000H is available at mwave and Amazon for $449 with its price drop yesterday. What you get for the $50 extra dollars is a 10" matte screen, a tad more battery life, N networking and Bluetooth. What you lose is the smallish size of the Aspire, half the hard drive space (160GB on the Aspire one, 80GB in two 40GB partitions on the EEE PC 1000H), and the lighter weight (the EEE PC weighs one pound more than the Aspire One). However, the Asus EEE PC 1000H gets great reviews and would be a nice option for someone, too! I decided to stay with the Asus Aspire One-- I want white, a glossy screen, and the smaller form factor, but I was tempted! The 6-cell Acer Aspire One finally came today and it is everything I expected! The screen is beautiful, the keyboard has large enough keys to touch-type comfortably, and it seems pretty speedy. Since I ordered it, there have been new versions of other manufacturers' netbook models, but I kept comparing and came back to the Acer Aspire One as my netbook of choice. With 1 GB RAM, a small form factor, a 160 GB hard drive, and Web cam and external mic, it is a little powerhouse! I have not tested the 6-cell battery life yet, but it is supposed to last 5 or 6 hours. I will be taking it to conference next week, and the real test is always how it performs as a presentation machine! I realize I have not posted to the blog for a while. I have been micro-blogging with Twitter and Plurk and using Facebook to keep in touch with many of my ed tech colleagues. I also realize that information that normally would have been shared via blogs is getting lost in the "Twitterverse". I have spent the last few weeks really working on making the Mac my main platform. (All my machines are Intel Macs which are dual-platform.) Those of you that know me know I am a die-hard Windows user and have been called the "terminally left-brained learner". Until OS X, I really was not comfortable using the Mac operating system and still had not spent a lot of time on that side of my computers. I took the plunge and moved my stand-alone Outlook folders of info up to MobileMe for my personal account, and moved my work folders to our gmail-hosted apps mail for our school domain. I also now am working on the Mac side of the machine for most of my tasks, with brief forays to the Windows side for the use of some applications. What a difference this has made in the way I do business! IMAP is the greatest thing! No matter what device I use, I have access to all of my folders of data, so I no longer have to say "Oh, that is on my work computer and I can get it for you tomorrow." I just re-read this series of articles from the Economist today, since we are studying it as an administrative team at a retreat next week. I suggest you give it a read if you have a chance. It is fascinating to think about the changes that ubiquitous access to the Internet is starting to bring to the work force. Just found the Flickr site with all the NECC-goers riding the mechanical bull in the exhibit hall. It is pretty funny to run the entire thing as a slide show! Because of my Second Life experience, I had no problem creating and editing my avatar, creating a room, and decorating it. It will be interesting to try this out with some educators (and, if we make a private room) with some of our students, if that is possible at some point. Here is my room "K-12 Educators". I cannot seem to find it in the search, but the URL, if you are trying Lively out, is http://www.lively.com/dr?rid=-5452546736007296038. It has been called to my attention that something I talked about in my presentation last week at NECC has been misunderstood. When stating that the ISTE docents had been "coerced into service" with the promise of a "virtual pat on the back", in addition to talking about how they are always there to help new users get acclimated, I was intending to point out that they are all volunteers. They help out in Second Life because they are the type of educators who will help out in real life, too-- not for money or fame, just because it is the right thing to do. 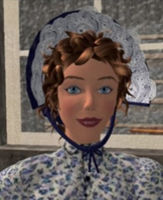 The ISTE community in Second Life has flourished in large part because of these educators. It is always interesting coming home from NECC. I spent four days talking to hundreds (if not thousands!) of like-minded educators who are engaged and excited about the current and upcoming possibilities of technologies to support teaching, learning, and professional development. I had one-on-one conversations with many dedicated educators who were there to learn, and I loved the time I could spend with them, learning what they get excited about. On the trip home, I still found myself talking to everyone. I ran into some NECC-goers in the airport, and we discussed our favorite sessions and the new things we saw. After our little group broke up, a businessman next to me started asking me about my laptop. I was more than happy to show it off. On the plane, I sat next to a retired Army general who was very interested in the Kindle, so I continued to "spread the word". At the sandwich shop in Atlanta's airport, I was using my phone (HTC Touch) to check my email, and three employees came out from behind the counter to take a look at it and learn more about it. On the bus home from Boston's Logan Airport, I had to tether the laptop to the phone to find a hotel reservation for the woman in the seat next to me, since the amount of traffic we encountered on the 90-mile trip caused her to miss both the last boat and plane to Nantucket, where she was planning to spend the holiday weekend. We talk about engaging our students and getting them up-to-speed on the 21st century skills. I guess I am figuring out that if we don't get the rest of the current workforce and the employers of tomorrow up-to-speed, too, our students may not get the chance to utilize these skills. Be generous with your time with strangers. Those of us that tote the "gadgets" need to explain the possibilities to others if they are interested. An educator is an educator wherever we are! 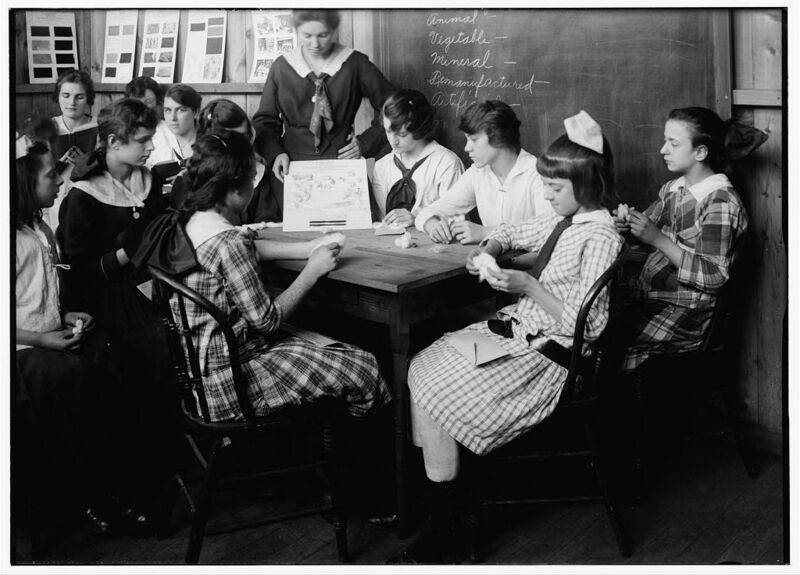 Photo courtesy of the American Memory Collection, Lewis Wickes Hine, Photographer. In the afternoon, I attended the ISTE-led session dealing with ICOT, the ISTE Classroom Observation Tool. I will have to investigate it more on my own before giving you more information. The closing keynote was crowded, and my favorite part were the video interviews with teachers presenting poster sessions about global education projects. Without fanfare, they described the meaningful work they were doing in their classrooms. Kudos to all of them! Once they are posted, many of the spotlight sessions, the keynotes, and selected other sessions may be found on this page. Thanks to TCEA for hosting the conference this year and thanks to the ISTE Conference Committee and staff for another job well-done! Today was another info-packed day. I watched the keynote from outside of the ballrooms with many others and it was great! I continued my journey through the entire exhibit hall from beginning to end and learned some new things from vendors. I then conducted my presentation in the big theater. I felt it was well-received and it was fun to be in that venue with so many educators! You can find the links and see the presentation as a Picasa Web album or a PDF handout here if you are interested. Later in the afternoon I went to Hall Davidson's presentation about the potential of cell phone use in the classroom. He gave an excellent presentation with practical sites and good ideas for the use of this technology that almost every student has in his or her pocket! He does not have the presentation posted yet, but it will show up here when it is. The NEISTE get-together was fun and I visited with old friends and made some new ones. This was followed up by a quick stop at the DEN event with tons of people, and then a quiet dinner with some of my DoDEA friends. I started off the day with Joyce Valenza and we visited a press suite where we learned more about PBS TeacherLine's new and upcoming professional development options and met with Discovery Education and Wilkes University to talk about their joint online master's degree in Instructional Technology. I then worked with a group of teachers, in the hallway, on the floor, on Moodle strategies (because we were blocked out of a workshop that was full) and it was a great collaborative time. I went to the exhibit hall to visit the vendors I wanted to catch up with, including Asus, so I could actually touch the new eeePC 901. It is sweet, out in 7 days, and all I have to decide is to get glossy black or glossy white. (The black one is cool looking!) Going back tomorrow to do the entire hall and see some new things! I rode the bronco while I was in the hall, too. Then I went to a Thinkfinity session with Chris Dede and Danny Edelson entitled "The Learning Multiplier: Using Multi-Device Environments to Engage Students". It dealt with innovative and practical practices for the use of smaller devices to conduct real-life data-gathering and research. I ran into tons of people and friends, and had a good time networking, of course! I finished up the day at a Google Apps presentation put on my Cristin Frodella and Danny Chang where they provided a very good overview of Google Apps for Education. We use it in our district, so I did not learn a bunch, but they did a very good job providing information for the audience members who were not using the suite of tools. On to the MICCA/VSTE reception tonight and then getting ready for my talk tomorrow! This session focused on both defining the meaning of various NETS*T for our table, attending four short sessions from great teachers who are conducting collaborative and global projects, coming back to discuss our "discoveries", listening to a short presentation by each of the contributing educators (so we could hear from the four we did not get to visit), and a chance to ask questions. I chose to be in the "Communication and Collaboration" strand, and was very excited about the discussions and presentations that I was able to see! The sessions were videotaped so I assume ISTE will be sharing this online as some point. Continuing on with the day! I took a little trip in Second Life today to the TX PBS TeacherLine and TCEA's shared site on one of the ISTE islands. 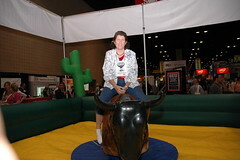 Took a bull ride and chatted with Joie Despres (SL) who was busy getting the site ready for NECC! She handed me a notecard to share with all of you about an event they are having on their sim area tomorrow night. On June 19 at 6PM SLT, put on your cowboy hats and boots and join PBS TeacherLine of Texas and the Texas Computer Education Association (TCEA), your Texas Ambassadors, as we welcome you to NECC in San Antonio, Texas 2008! We are going to fire up the barbecue, put on some country western for a little line dancing, and get real crazy with a bull-riding contest. Yeehah!! So, come on down!" I immediately went out and found a cool cowboy hat! Looking forward to the event in SL and even more to the event in San Antonio in RL! The Kindle is a interesting device! Having 10 hours at a time (twice!) on the bus to and from Washington, DC, to put it through its paces, really gave me time to learn how to use it well. The screen is easy on the eyes although I still have to remember I need an external light source to read it. The bus seat lights worked just fine as did reading it in the bright sunlight outside. The "experimental" browser takes some getting used to, but once I started using the mobile versions of sites, like I do on my Windows Mobile phone, I could do just about anything I needed to do. I even posted to Twitter! I listened to an audiobook for some of the time, and that worked well, too. I practice marking things up, creating clippings that could be searched later, and read some of my own content I had put on the device. The battery life was really long, but I don't know how long, since I was busy taking care of chaperoning duties in-between! I did shut the wireless off while listening or reading, and I know that extends the battery life, too. We have just purchased two Kindles for our high school library as a pilot, and I found out a couple of things. First, you can have up to 6 Kindles tied to one Amazon account, and, if you buy a single title, you are allowed to put it on all 6 of them. Secondly, since any user of the Kindle can purchase a new title from the Kindle store from the Kindle itself, we did not know how we were going to control students from purchasing books on a whim. We are solving the problem by putting a gift certificate on the Amazon account with no other method of payment on the account. The teachers will spend the gift certificate funds to purchase a bunch of titles, so there will be no payment method available to purchase new titles by the users. We will just load the books up with the purchased titles. I will have the Kindle at NECC with me if anyone is interested in trying it out...just ask me when you see me! Well, as with Wii Sports, I can only do things well with the Wii Fit that I can also do in real life. In Wii Sports, I can bowl, which I can do in real life, and I cannot play tennis, which I cannot do in real life. With the Wii Fit, there are activities in the areas of strength training, yoga, aerobics, and balance games. Well, I cannot walk a tightrope in real life, nor ski a slalom, nor ski jump, nor head a soccer ball, and I did not do so well in these balance games. I was better in the aerobics area. I could not twirl the hula hoop, something I have never mastered in real life, but the step aerobic sessions were a good workout and I could follow those. On the island run, I became winded after a time, as I would have in real life. Time for the morning workout now. If you have a chance to try the Wii Fit, go for it! Earlier this week, Best Buy started carrying the Asus eeePC with Windows XP Home installed. Mine arrived yesterday (no suprise there, eh?) and I have been having some fun with it. The original eeePC had a 4gb flash memory drive and came with a flavor of Linux. Those are still available, are speedy little items, and come with a nice suite of office, creative, and educational applications. The Windows XP Home version, at the same $399 price point, comes with Microsoft Works 9 in addition to the default Windows operating system applications. Since the Windows OS is larger and uses up a substantial portion of the 4gb hard drive, I had to make some application decisions since I was planning to use this device as a traveling and presentation device. I deleted the Windows Live applications and Microsoft Works, and installed PowerPoint XP (I figured it was smaller than the current versions) and some really old, tiny versions of FTP software and HTML editing software which will do what I need them to do while on the road. I also installed a very old version of Paint Shop Pro which will give me the capability to do image editing if need be. As for new apps, I installed Skype and Trillian, AVG antivirus, and MS ActiveSync for my Treo. When I am in a networked environment, I can use all the great Web 2.0 apps for everything from databases to full image editing. I just wanted to make sure I had the things handy I needed when not on a network. In addition, I loaded up a USB flash drive with PortableApps (http://portableapps.com/) so I also have access to some versions of pieces of software that run directly off the Flash drive. Using the SD slot to house a card for storing files, I still have 1/4 of the drive free for future needs. For schools thinking about purchasing the eeePC, you will want to talk to your tech gurus to find out the feasability of Windows XP Home in a server/domain environment and also consider the Linux version of the device if there is a client that will work on your network. For me, it is nice to have the familiar XP environment, but the suite of apps on the Linux version would be nice to have for students. If you have any questions, feel free to write! There are so many cool Web apps out there, it is hard to just talk about a few. I encourage you to try any new Web app that you think might help support teaching and learning and add your favorite(s) to the comments below! Alltop.com presents a categorized page of RSS feeds in all types of categories, education included. It is an easy way to quickly get feeds from the most prolific, informational, and news-worthy blogs. When trying to explain the concepts of RSS and aggregation during a professional development session for teachers, I found demonstrating Alltop a good way to introduce them to those topics by letting them investigate the site. Voicethread has really become popular with educators. A Voicethread "is an online media album that can hold essentially any type of media (images, documents and videos) and allows people to make comments in 5 different ways - using voice (with a microphone or telephone), text, audio file, or video (with a webcam) - and share them with anyone they wish. A VoiceThread allows group conversations to be collected and shared in one place, from anywhere in the world." It is easy to use, powerful, and a lot of fun! Twitter is a wonderful tool. Imagine having access to all your personal and professional friends and colleagues for help and support all of the time! Educators are using Twitter to share and gather facts and information from other educators all over the world. Users keep a client open on their desktop, and another user can post a question (I asked my education friends about their school-sponsored student e-mail naming conventions yesterday before deciding what ours would be) and the wonderful, helpful education community always comes through with plenty of suggestions and thoughts! Users can write to you directly or answer the question by directing the answer to you but allowing others to see the answer, too. The "tweets" are limited to 140 characters, so I have become a very succinct question and answer creator! These three are enough to keep you occupied for hours-- have fun and please share your new discoveries with the rest of us in the comments! Am I the only one who is constantly using a time zone converter to figure out what time I am supposed to be somewhere online? With Webinars and Second Life, and other synchronous meetings, I am always asking for time verification from the workshop coordinators. In 1998, Swatch, the Swiss watch company, created "Swatch Internet Time" to alleviate this problem. We used it in our house, and my son even has two Swatch watches that tell the time in Swatch Internet Time. Swatch Internet Time is the same all over the world! I think this is an idea whose time has come, and urge you to try it out and see if you like it. No more wondering if that particular US state does or does not move their clocks ahead or back. No more worries about the time in Australia. Swatch Internet Time takes care of all that! You can simply keep this URL handy to see the current Swatch Internet Time. You can even get a widget for the Mac OS here and this World Clock program for Windows also includes Swatch Internet time. This page is a bit older, but some of the Internet Time clocks are still available to use and/or download. Let's all get in the same time zone, okay? Here are two photos of my "blinged out" Macbook Air. It has a Unique Skin vinyl skin that I created by uploading a photo to their site. Matching desktop wallpaper and vinyl skin...cool, eh? It took a while, but I found the answer was to decrease the hardware acceleration of the graphics card. To do this on XP, simply right-click on the desktop and choose PROPERTIES-SETTINGS-ADVANCED-TROUBLESHOOT. I had to drag the slider down to the middle of bar in order for the wmv movies to run within the PowerPoint presentation. This disables some things that apparently could cause problem with Direct X programs, but I need the videos to work right now. It is easy to set it back to full for all other applications. This must be an interesting chipset. I found newer drivers, but hesitate to install them because of the Bootcamp/Windows/Mac thing. However, I did find a fix for those with the Intel 965 chipset (on any computer) who cannot seem to get Second Life to run. That post is here. I successfully followed these directions on a student's Dell laptop with Vista earlier this week and he is having no problems! I promise not to continue with many more postings on the Air. However, people are reading and responding and asking me additional questions via email, so I feel compelled to share what I learn to save others some time! Second Life works tremendously better on the Mac side and there is no lag. The VGA-out dongle worked fine. On the Windows side, you need to use the Intel mirroring software and on the Mac side you have to set the screens to mirror. By the way, the native resolution of the Macbook Air is the same as the Macbook @ 1280x800. 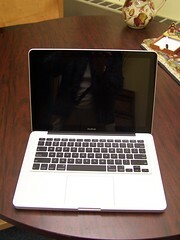 Below you will find two photos of the thickness/thinness factor of the Macbook Air. Clockwise, the items are the Macbook Air, the Fujitsu P1510D tablet, the XO, an iPod Touch, a Treo 700wx, and the Asus eeePC. I tried Twitter a few months ago and did not "get it" and I stopped using it. I picked it back up this weekend, and today I had that "a-ha" moment and realized why I will continue to use it. I discovered a neat techno-trick today. I had a 118 MB, 84 slide PowerPoint presentation that I to move into someone else's template and it was not going well. So, I simply saved the presentation as JPEGs, created a photo album in PowerPoint with the organization's template as the background and imported the JPEGs of the slides, and just resized the JPEGs on the slides so their logo showed. Imagine my surprise, after saving this new presentation, to realize that the 188 MB PowerPoint presentation was now only 5.6 MB! I don't know why, but, in case you are interested, here are the steps again. Save your large presentation as JPEGs which creates a folder with each slide as its own JPEG. Open a new presentation and choose to create a photo album in PowerPoint, choose the folder of JPEGs as your "photos" and then save that photo alubum. Miraculously, the slide show is much smaller than the orginal! So, usually when I have a techno-discovery I go charging out of my office to share the news with someone-- a teacher, secretary, or even a 6th grader if they will listen. No one is usually very interested. However, today I went right to Twitter to share my discovery with people who ARE interested! I have figured out the power of Twitter (for me) is the ability to share my ideas and thoughts with like-minded individuals who DO get excited about geeky techno-discoveries and enjoy sharing their own, too! w00t and thanks to my Twitter buddies! I attended FETC08 in Orlando last week and learned so much from everyone I came in contact with! The DEN Preconference, the concurrent sessions, and all of the collegial collaboration that I engaged in, really revved me up for taking some new steps. I have signed back on to Twitter to see if I can handle it, and, thus far (the last 24 hours) it is manageable. I only have a few people's tweets come through to IM, but read the rest of the feeds from the Twitter page. I have just added it to my daily routine-- work on the Schrockguide, read my Bloglines feeds, and now check the "tweets". I have even used Twitterfeed.com to feed my blog entries to Twitter. We will see how that works out. I could not locate anyone with an XO at FETC, although I did get to show it off to a lot of educators at the conference. (And the TSA at the airport security checks!) It is a bit heavy to carry two laptops (although the other was the Fujitsu P1510D tiny tablet and by the time NECC comes will be the Macbook Air), but I think I will make the effort again for NECC. I want to try out the mesh networking option with other teachers. I will be sending out some of the sites I discovered at FETC08 as my Sites of the School Week over the next few weeks, so, if you are interested, you can subscribe to the weekly email here. Okay, so everyone knows the things you can find on YouTube are amazing! One item that I searched for after I read about on a blog, was a video using Dean Friedman's song "McDonald's Girl". Dean Friedman is a folk singer/storyteller who I have been following since I first saw him perform at Rutgers in 1978. He still does some US tours, but he does a lot of work in England. In any case, I found the following YouTube video from a high school pep rally in 2006. This video struck my fancy, and I always laugh aloud when watching it. For those of you, like me, who have attended pep rallies every year, and have seen some "not so stellar" performances, I felt this one was great! As you know, I am a gadget geek! I have been seeing the term "MID" (Mobile Internet Device) bandied about lately and have heard devices such as the Asus EeePC called an UltraMobile PC (UMPC), which I knew it was not. Today there is an entry on Engadget describing the differences. So, let's see where my own secondary devices land based on this description. Hum, it seems the lines are blurring and perhaps the definition provided may not be as definitive as it could be. For example, the Asus EeePC (MID) does media well, also has an office suite, and it runs Linux. It could actually pass for an UMPC if it had a touch screen. The original specifications for the UMPC included multiple input methods, Microsoft Windows Tablet OS, and that it was smaller and lighter than a laptop. I need a device somewhere between a MID and a UMPC to take advantage of low cost, but with the inclusion of some power on the machine locally. I will continue the search! XO Laptop from OLPC arrives! This post is coming to you from my XO laptop which arrived last evening! It is an interesting little device. The learning curve, for me, was steep since it does not act like a "regular" computer. I could not figure out how to open it, the terminology used is different, and it seems to have a personality of its own! It takes more time to start applications and attach to access points, but, then again, I am spoiled by other new technologies. It is also rather heavy for its size but seems very rugged. However, for its intended purpuse to educate students, it includes an amazing array of quality software and the collaborative functionality to allow students to work together from other XO's is available throughout the operating system. The speakers are loud and clear, and this comes in handy with the applications that rely on audio-- both a beginner and more advanced music composition applications, and an acoustic-circuit (and electrical-circuit) construction application. The really good camera can be used for talking photos and video. There are drawing applications, a data collection tool which graphs sounds via the included microphone and one that measures the distance between XO's via sound, a memory game, computer programming via Python, and a multimedia authoring program. Of course, it includes a browser and simple word processor and several other applications, including an RSS newsreader. I will probably bring this along to FETC to find someone else with one so I can try the mesh network and also to collaborate with someone else from within the applications to take advantage of the intended strengths of the device.